Trout Hotel HotelWith free Wi-Fi throughout, the award-winning Trout Hotel is situated on the banks of the River Derwent, in Cockermouth. The town is adjacent to the childhood home of poet William Wordsworth. Ideally located for the Western Lakes and Cumbria's Energy Coast, this 4-star property combines contemporary luxury and period charm. 49 luxurious well-appointed bedrooms feature satellite TV with Sky Sports. Bathrooms include complimentary White Company toiletries. Some rooms boast garden and river views. The elegant Derwent Restaurant serves fine English cuisine from an extensive à la carte menu. The modern Terrace Bar & Bistro has a varied menu and a heated outdoor seating area. 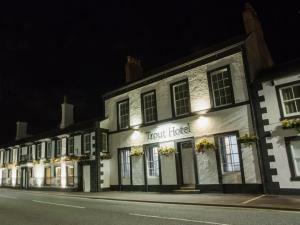 The Trout Hotel has been a finalist in many regional and national awards, including Visit England and Cumbria Tourism's 'Best Large Hotel'. Bassenthwaite Lake is a 10-minute drive away and free parking is available at The Trout. The hotel can arrange golf and fishing locally and the town leisure centre is only a 5 minute walk from the hotel. Children welcome from any age. From M6 jct 40, head west on A66, follow signs for Cockermouth. From Carlisle head west on A595 direct to Cockermouth. From Maryport,- 4 miles, coastal rail link to Workington, 8 miles from Cockermouth or Maryport, 4 miles from Cockermouth. Staff were very friendly and welcoming. Room was large and well decorated and equipped. Breakfast had good choice of hot and cold dishes. Well positioned in Cockermouth. We would stay here again.